The Winnie Mae was built as a Lockheed Vega Model 5B, and modified later to a 5C. It was named for the daughter of its original owner, F. C. Hall, who hired Wiley Post to pilot the plane, which had been purchased in June 1930. Post later purchased the plane from Hall. The Smithsonian Institution purchased the Winnie Mae from Mrs. Mae Post after her husband’s death. 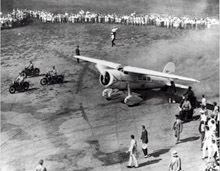 The purchase of the plane for $25,000.00 was approved by an act of congress on August 24, 1935. The actual appropriation of funds was authorized by a separate act of congress on June 22, 1936. Paul Garber of the Smithsonian personally escorted the Winnie Mae to her new home in Washington, D.C. Included in the sale were the plane’s original instruments used on the around-the-world flights. The instruments had been installed in the plane that Post and Will Rogers flew to Alaska and were retrieved from the wreckage. They have not been reinstalled in the Winnie Mae. The Winnie Mae was originally on display in the Smithsonian’s Arts and Industries building on the National Mall. It was later on display in the National Air and Space Museum when it opened in 1976. Wiley Post’s pressure suit and the detachable landing gear were on display with it. At some point later it was moved into storage at the Paul E. Garber Preservation, Restoration, and Storage Facility in Suitland, Maryland. It was stored in pieces and was not on public display. 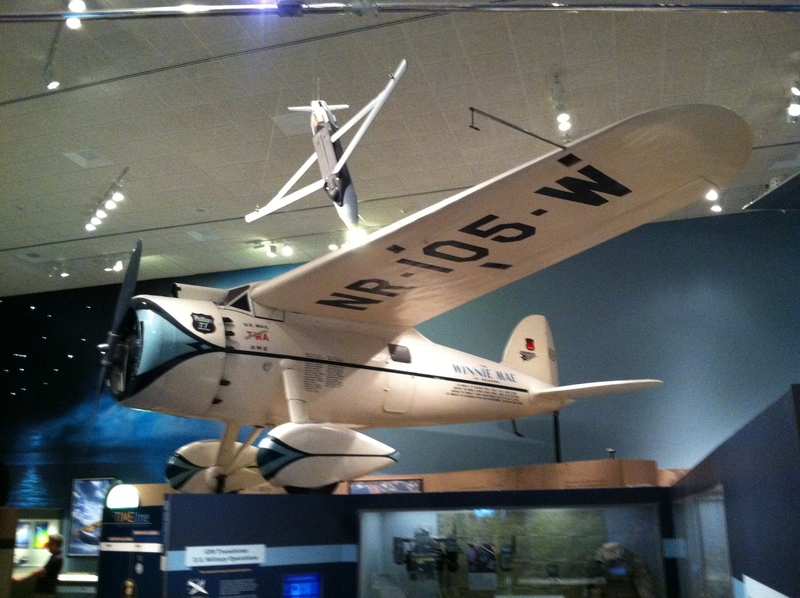 The Winnie Mae was on display at the National Air & Space Museum’s Steven F. Udvar-Hazy Center adjacent to Washington D.C.’s Dulles Airport when it opened in 2003. In 2011 it was moved back to the Garber facility to be prepared for installation in a new exhbit. In 2013 it went on display at the National Air and Space Museum in Washington, D.C. in the “Time and Navigation” gallery on the second floor. More details. A replica of the Winnie Mae hangs in the entrance hall of the Oklahoma History Center in Oklahoma City. The museum also has some of Wiley Post’s personal effects on display nearby. Wingspan 12.49 m (41 ft.), length 8.38 m (27 ft. 6 in. ), height 2.49 m (8 ft. 2 in. ), and weight 1,177 kg (2,595 lb.) empty.